I Accept full responsibility for the information I will provide ACCONDU CONSULTING in this request to guide and facilitate applying for a Nigerian E-Passport. 1. Passport Application form to be completed and emailed to you. 7. There may be a Biometrics processing fee in USPS money order payable to the Consulate General of Nigeria, Atlanta only during remote passport intervention. Disregard if you are going to the Consulate. 8. There may be an Additional Intervention Administration fee payable to the Facilation team during remote passport intervention. Disregard if you are going to the Consulate. 9. For applicants between the ages of 0-17, please pay close attention to the "REQUIREMENTS FOR PERSONS UNDER THE AGE OF 18" section, as there are additional requirements for minors. *Applicant will be required to appear in person for biometric and image acquisition. 4. Photocopies of the parents’ passports data page. One of the passport data pages must be a Nigerian Passport. 8. Please check the consulate website for any Processing fee payable to the Embassy of Nigeria. 9. Applicant will be required to appear in person for biometric and image acquisition. 1. 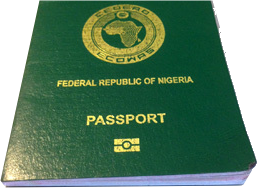 Non Nigerian born applicants must provide a copy of the Nigerian passport and letter of authorization from a Nigerian parent that appears on his/her birth certificate as right of citizenship. PLEASE SELECT ATLANTA NEW YORK WASHINGTON DC. We are a private "Nigeria Passport & Visa" facilitation service company and we are not affiliated with the government. I agree to the rules and terms of service.